Complete feed for coldwater fish. Complete food for all goldfish. Clean & clear water formula. For health, colour and vitality. Biologically balanced. Tetra Goldfish's supreme quality guarantees the best for your goldfish. Carefully selected mix of highly nutritious ingredients with vitamins, minerals and trace elements for complete nutrition. 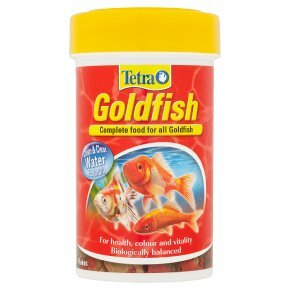 Tetra Goldfish - nutritionally balanced premium flake food for all goldfish. Tetra Goldfish's supreme quality guarantees the best for your goldfish. With Clean and Clear Water Formula plus patented Active Formula* to support a long and healthy life. Carefully selected mix of highly nutritious ingredients with vitamins, minerals and trace elements for complete nutrition. Feeding guide: Several times daily in small portions.